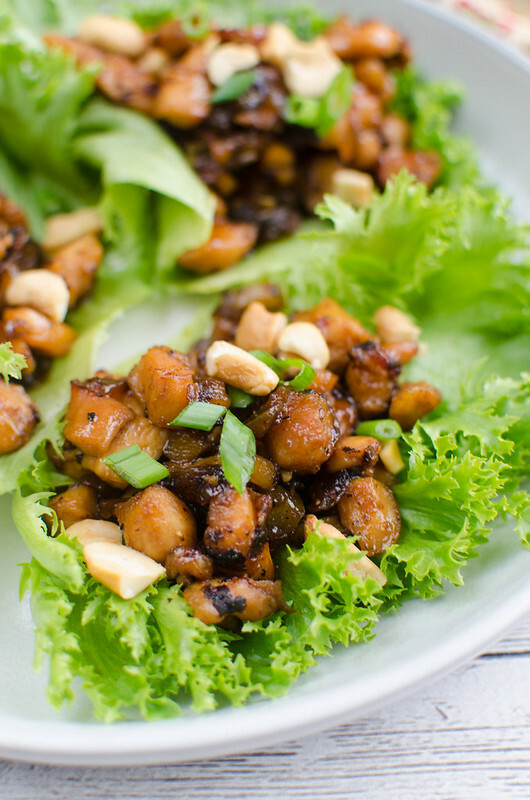 Cashew Chicken Lettuce Wraps – delicious healthy dinner recipe! 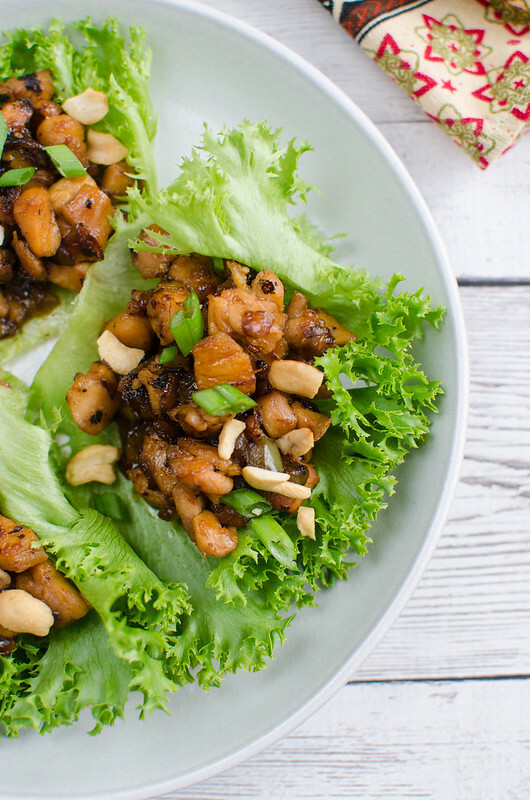 Lettuce Wraps filled with chicken and veggies in a delicious sauce and topped with crunchy cashews. Perfect for healthy meal prep! This post originally published in 2013. Updated on January 3, 2018 because the photos made me want to cry. Should we talk about resolutions? I love a new year and a fresh start and setting up intentions and goals. My current resolution list is just a bunch of tiny things that take up 3 pages of a google doc. They’re mostly like “Quit being super cheap and spend the $15 a month on Audible because you love listening to books while you cook”. Nothing life changing. Just little things that I hope will ultimately add up to make be a better person, better mom, better business woman over time. I also tend to start eating healthier and cleaner but I think it’s more just getting back to normal. Because from Halloween to New Years, we all indulge a little more than usual, right? It’s less a resolution and more just getting back to what we were doing before we had bags and bags of tiny candy bars in our house at all times. Cashew chicken used to be my faaaaavorite Chinese takeout order when we were in Colorado. The place by our house did it so well and then we moved to Texas and I can’t find good cashew chicken to save my life. So I switched my order to Mu Shu Pork but anyway. I’ve been making these Cashew Chicken Lettuce Wraps since I got into paleo eating, in like 2012. It’s not totally paleo because of the hoisin but you can leave that out if you are strict paleo. It’s delicious without it – I just started adding it in within the last year or so because at some point I became obsessed with adding hoisin to everything I eat. So it’s chicken thighs (use breasts if you want) cooked with onions and green peppers and coated in a slightly sweet, slightly tart, slightly spicy sauce and then tossed with chopped water chestnuts for some crunch. And then finally the cashews. I like to add some while cooking so they soften slightly and then put more on top for extra crunch. Use whatever lettuce leaves you prefer – I love butter lettuce for these but went for the pretty ones for these photos. It’s perfect for packing in a lunchbox. 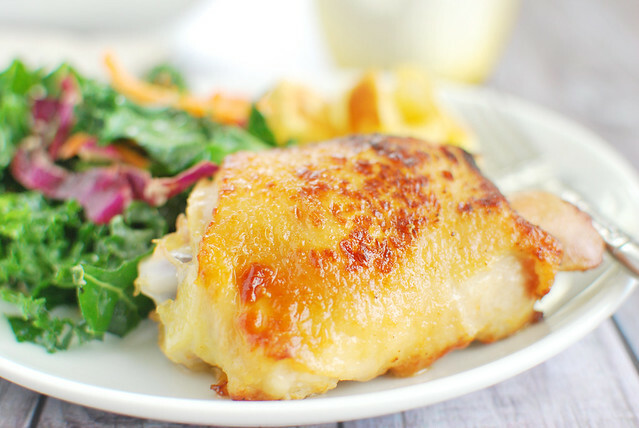 Just pack the lettuce separately from the chicken so it stays crisp. Make sure you subscribe to my email list to get all my new recipes right to your inbox! Heat coconut oil in pan over medium heat. Season diced chicken with salt and pepper. Add to hot pan and stir fry until browned. Add onions and green pepper and cook until the onion is translucent and the chicken is cooked through. Add water chesnuts, sauce, and cashews. Cover and let simmer over low heat for about 5 minutes until sauce has reduced and cashews have softened slightly. 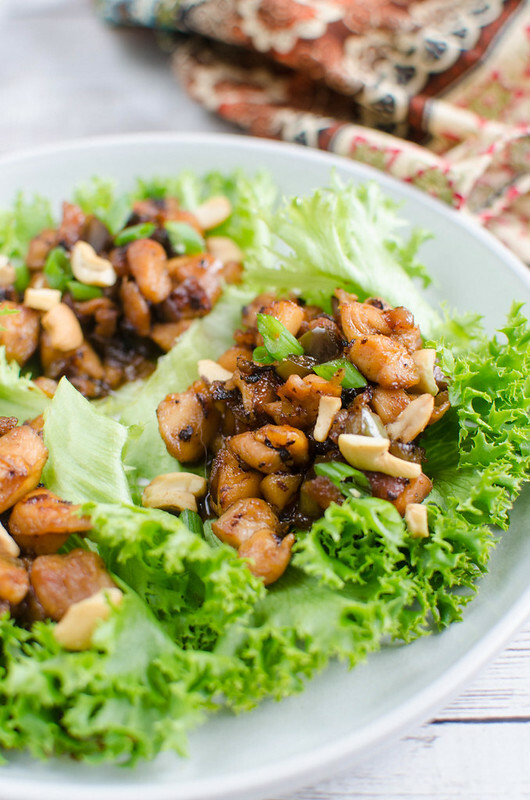 To serve, spoon chicken mixture into lettuce leaves and sprinkle with green onions and more cashews. 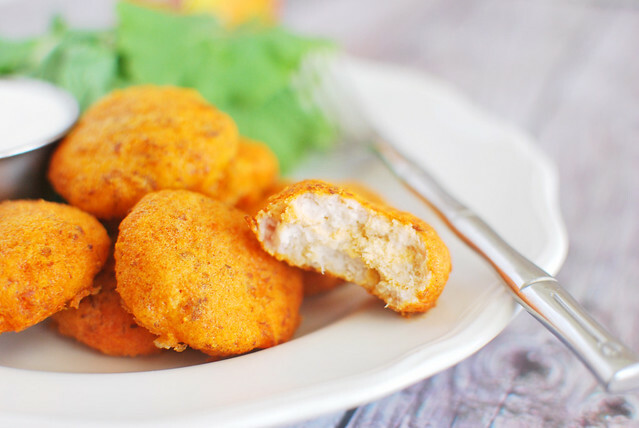 Want more healthy chicken recipes? 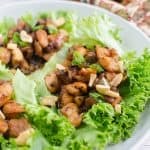 8 Responses to "Cashew Chicken Lettuce Wraps"
I have been loving your football recipes but am enjoying this brief caloric break with refreshing lettuce wraps :) Thanks for sharing! No football food needed when cashew chicken is involved. 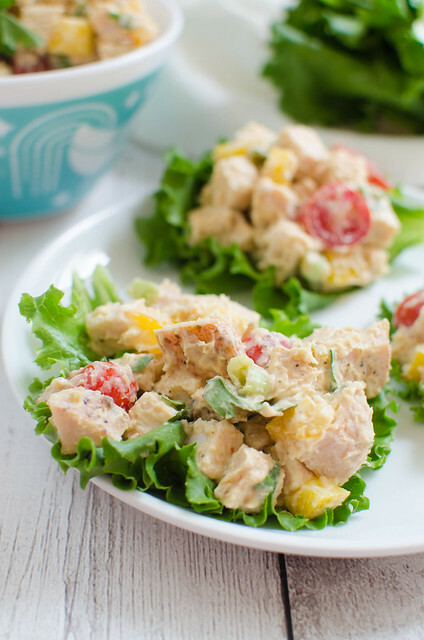 It’s one of my favorites and I love the lettuce wrap twist! Can your husband call my husband and talk to him about this whole shopping thing? I can’t remember the last time my husband went to the grocery store :P Anyway, this cashew chicken sounds insane – this sauce is full of all the best ingredients! Love this! Sometimes I don’t want a giant bowl of rice with my cashew chicken. This is perfect. Yum! I am so making this! Even my daughter will eat lettuce wraps, and with cashews? YES! I love lettuce wraps, I always order them at the Chinese restaurants but never made them at home. I want to try these they look delicious! I’m totally with you about the cashew chicken. It’s my favorite take-out order, but ever since we moved to SA, I can’t find a decent one to save my life. Thanks for the recipe!